After another long gap we got an opportunity, in the form of a 4 day Christmas holiday, to go on an outing. It was late by the time we started planning and getting accommodation was getting difficult. After evaluating different options, we closed in on to either Conoor or Kudremukh. We got a booking in a small hotel in Conoor. 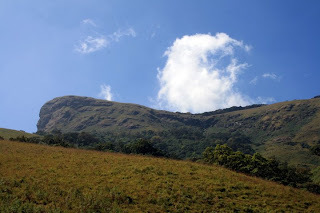 But Kudremukh was more tempting as we had read quite a bit about it and it appeared more beautiful and pristine. 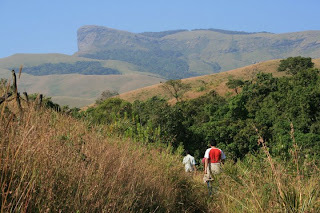 Kudremukh or "Kudere Mukha" literaly means "Horse Face". It gets this name from the highest peak in that region which resembles the face of a horse. 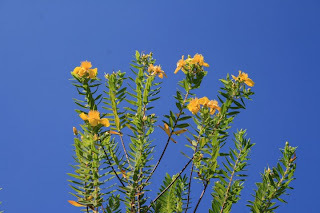 It belongs to the Western Ghats mountain ranges of India and has 600 sq. km. of protected forests. There was a large open pit iron ore mine by KIOCL (Kudremukh Iron Ore Company Ltd.) which has ceased operations now owing to environmental pressures. So we tried our luck for Kudremukh next. Most of the telephone numbers of hotels and lodges in Kudremukh mentioned in the internet were old and after quite a struggle we got the numbers. There were not too many places in Kudremukh town itself, as it is mostly the KIOCL campus. The KIOCL guest house was closed for renovation and the forest department guest house was full. There were quite a few lodges in a place called "Kalasa" nearby (Around 20kms from Kudremukh). Kalasa is a religiously significant place in Karnataka, related to the "Pancha Teerthas". We got accommodation in a place called "Chandan Lodge". The total driving time would be around 8 hours and we intended to reach Kudremukh before noon. With everything settled, we decided to start early morning 3.00 am from Bangalore. That way we would be out of most cities on the way before daybreak. Starting in previous day evening and doing a break journey would have been more tiring; we would have had to tackle all the traffic jams on the way. We took the Tumkur road and at Neelamangla diverted towards Mangalore. We crossed Hassan early in the morning. There is a nice lake with a view of wind turbines near Hassan where one can take a break early in the morning. From Hassan we quickly reached Belur and finally reached Chikmanglur around 7.30 am. We had our breakfast in a small road side hotel and then headed towards Kalasa. We had heard the road via Mudigere was pretty bad so we took the diversion before Mudigere which goes towards Sringeri via Aldur & Hallebennur. The road was decent, though not as good as the road till Hassan. We went straight to Kudremukha, passing through Kalasa hoping to do some sightseeing before hitting the Lodge. The town of Kudremukha has nothing much offer, apart from the KIOCL premises, which is more of a ghost town now. At the entrance of KIOCL, the traffic circle has two interesting vehicle tires sculpted out of wood. There is a dam named "Lakya Dam" in Kudremukha built by the KIOCL company. The purpose of the dam was to collect and hold the waste materials and silt generated by the iron ore mining process. So don't be surprised if you don't see any water there, but just red mud. Entry is restricted to evening 4:30-6:30PM on week days and daytime only on Sundays. The silt is apparently dangerous like quick sand and there have been instances of animals getting trapped and drowning in the lake. There are guards posted at the dam entrance to prevent any dangerous mis-adventures by the visitors. There are a couple of small water falls on the road side, but the biggest and most beautiful is the Hanuman Gundi falls. A set of stairs lead you down to the water falls which are more than 100ft in height. Monkeys abound in the trees adjoining the falls, thriving on leftovers thrown by partying humans. Parking is available at a small clearing near the entrance to the water falls. There is an entry fee of Rs.20 to the waterfalls. We also went to the forest department office near the KIOCL gate. The officer there was friendly and showed us different trekking options. 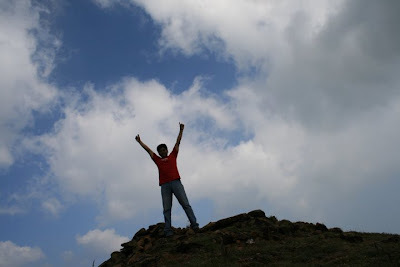 We selected the one to Kudremukh Peak and paid the trekking fees. Total fees for the four of us was Rs.650 (Rs.50 entry fee per head, Rs.75 trekking fee per head, and Rs.150 guide fees). The officer gave us a handwritten piece of paper as acknowledgment for the fees which was to be shown to the guide the next day. 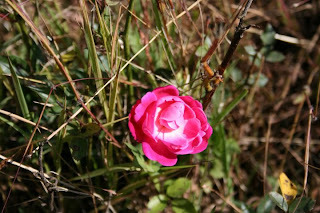 The trek was to start from a village named "Mullodi" where we were supposed to meet our guide. Mullodi could be reached by Jeep from a place called "Balgal" on Kalasa-Kudremukh road. We came back to Kalasa tired and hungry as ravens and checked in to "Chandan Lodge". The rooms were clean, but the lodge was noisy from a crowd of noisy youngsters occupying the dormitory. Our rooms were clean enough and spacious, with hot water and a TV. We dumped our luggage and went out to have some quick food. We had great dosas (not oily at all!) from the nearby "Yatri Nivas" cafeteria. After having our food, we went for a stroll to the nearby "DakshinaKashi Kalaseswara Temple". This seems to be a pretty old but beautiful temple. There is a spacious parking place outside. You need to leave your footwear down and climb the stairs up. The temple has a big "Natya Mandap" near its entrance for public functions. Right at the entrance there is a big idol of lord Shiva. Inside, the courtyard is spacious, at the center is the main temple with beautifully sculpted wooden doors. The temple is apparently very old. There are quite a few ancient stone pamphlets with some ancient writings preserved at the rear of the temple. Guys have to enter the main temple bare chested. It was dark and I had only my point and shoot camera with me. I decided to come back again sometime during the day just to take the photographs and we left the temple and walked back towards the Lodge. Back at our rooms, we had nice bath and some rest till 9PM. At 9 we dragged ourselves out of bed for dinner. There was a restaurant at the ground floor of Chandan Lodge. On entering we found that more of a drinking place than eating place. The plates that the waiter brought were dirty. He apologized, went back and came again with dirty plates! Yuck! We immediately left the place and went out to another place we had spotted during the day - "Hotel Vijaya" on the same road as "Yatri Nivas". The place was clean, the owner friendly, and the food appetizing. Thus ended our day 1 and we all went to sleep. There were no mosquitoes to trouble us. We woke up early in the morning at 5:30AM. Outside it was misty and cold in the morning. The only place open for breakfast was the "Yatri Nivas". I stocked myself with two plates of steaming idli and one hot coffee before driving down to Balgal. We parked our Swift near the shops and hired a Jeep for the ride up to Mullodi. Mullodi is around 5km ride among rocky uphill road that only the 4WD Jeep can travel. Of course, you can also walk if you want, but budget the additional time for that. The Jeep ride costs 350-450 one way, depending on how far up your assigned trekking guide lives. Our trekking guide had already started with another group and we were supposed to meet them at Satisha's place in Mullodi. So we had to go up to Satisha's home which lies just by the side of the trekking route. We started after a brief wait at Satisha's place. The initial route was flat with some mild up and down slopes. 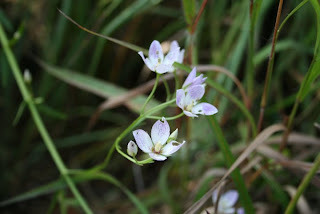 The path had many beautiful streams crossing it and beautiful wild flowers among the grass. On the way was "Lobo Mane" or Lobo's House. This was one of the houses made by Simon Lobo, a priest who stayed in the Kudremukh ranges. Lobo's house is apparently used by trekkers for overnight stay, but it is today in a sorry state. 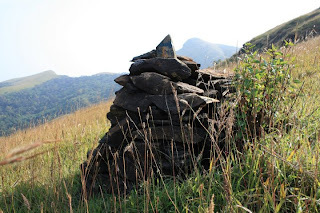 Distances along the trek path were marked by mile stones made by piling up stones. It was around 13kms one way from Satisha`s house to the peak. The beauty of the path can only be experienced first hand. The few pictures will not be doing full justice. It is only after one gets a clear picture of the hills can one see why it is called the "Horse Face". The cliff does look like the outline of the face of a horse looking up towards the sky. Have a look at a comparison photograph I've posted below. The steepest part is an one km distance around 3-4 km from the peak. This is where I had to leave behind Mitu & Mamuni and carry on alone. From the steepest part one can see the shola forests on the adjacent mountain. The last 3 km is blissfully flat. There is a small stream around half a km from the peak. I was out of water, but resisted drinking from the stream. A few hundred meters later was the peak. Standing on the peak was an experience in itself, you feel like a king having conquered everything around you. Everything around you stands below you. The cool breeze blows unhindered at the top. It had taken us 5hrs to climb to the peak. I started climbing back after spending few ten minutes at the peak, came down towards the stream and sat there. As I removed my shoes I saw some leech bites, the leeches had already fallen off. I sat there dipping my leg in the cool water. The water looked clear and clean, I couldn`t resist anymore, and I filled up my bottle and drank some. It was such a relief! I drank almost half a bottle, filled it up again for the walk back and started back. On the way back we spotted a Sambar grazing in the jungle below. I felt sorry that I did not carry my 300mm lens with me to the top. I got only a hazy shot with the 55mm lens I had. Walking back down was also not easy, as the leg muscles were already worn out. I met Mitu and Manumi half way down and we walked back together towards Satisha's house. We spotted the same sambar again near a stream downhill, but it ran away hearing our voices. By the time we reached back at Satisha's house it was 5:45 in the evening. The Jeep arrived at 6:30 and carried our tired bodies back to Balgal. The 26km trek without enough rest and food was too draining. A better option is to stay overnight at Satisha`s place (they charge around Rs.150 per head for stay and dinner) and start early in the morning, have some lunch at the peak and climb down after some rest. By the time we reached back at Kalasa, it was 8:30PM. We headed straight to "Hotel Vijaya", had Chicken Curry, Fish Fry, Egg Curry, Dal Fry, Chapattis and Lime Soda. At the hotel all of us fell down to our beds and had a refreshing sleep. We started late at 8:00AM. Had a filling breakfast including Neeru Dosa, Upma, Idli, Vada and Coffee at "Yatri Nivas". Then we started towards the "Annapurneswari Temple" near Horanadu. We reached there around 9:30. We came to know that you get delicious lunch there, but there was a daunting looooong queue even for the darshan and we came back. We decided to come back to Kalasa after having some tender coconut water there. Back at Kalasa we re-visited the "Dakshinakashi Temple" to take some pictures and buy some honey. Then we checked out of the hotel, had lunch at "Hotel Vijaya" (Egg Fried Rice, Fish Fry, Egg Curry and Buttermilk) and started back towards Bangalore. On our way back we came by Mudigeri (by mistake). The road from Kalasa to Mudigeri was not great. By afternoon 3:30 we had reached Halebidu where we stopped by and visited the temple. We started again from Halebidu by 6PM towards Bangalore. We crossed Kunigal at 9:30PM and had our dinner at "Shark Dhaba" midway between Kunigal and Neelamangala. The food was delicious and service efficient. We reached back home at 12 in the night. great stuff, especially the phone numbers part. it was useful for me. Very informative post! Loved the pictures too. 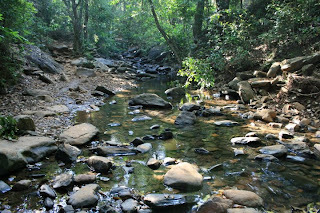 very reliable info...did a trek to kuduremukha based on the info given in the travelogue. Absolutely spot on! plan to do kumara parvata some time soon, was wondering if you have some info on that as well. Glad that you found this useful. Sorry, I had been lazy during my Kumara Parvata trip few years back... had not compiled the info.